Saturday April 23rd 1921 Cora called me early to say they were going to Cedar Rapids for the day. I hurried Hatties table cloth, washed and ironed it. I was busy all day. Monte was here a little while in the morning. Rob did not come home to dinner. The girls came at six oclock. I had supper ready. We drove to town after supper. Read awhile and went to bed very tired. Sunday April 24th 1921 I helped do up the morning work. Hattie went to church. Cora at home but to the store in afternoon. I took a long sleep. A warm windy day. Hattie & I rode back to town with R & C and went to Presbyterian church. Walked home. Monday April 25th 1921 Hattie & I went in the garret to work in forenoon. She stopped to get the dinner. I worked on up there till nearly three oclock. She went to town. Cora home in PM. Thee was a hard rain about noon. Bro Charlie birthday. 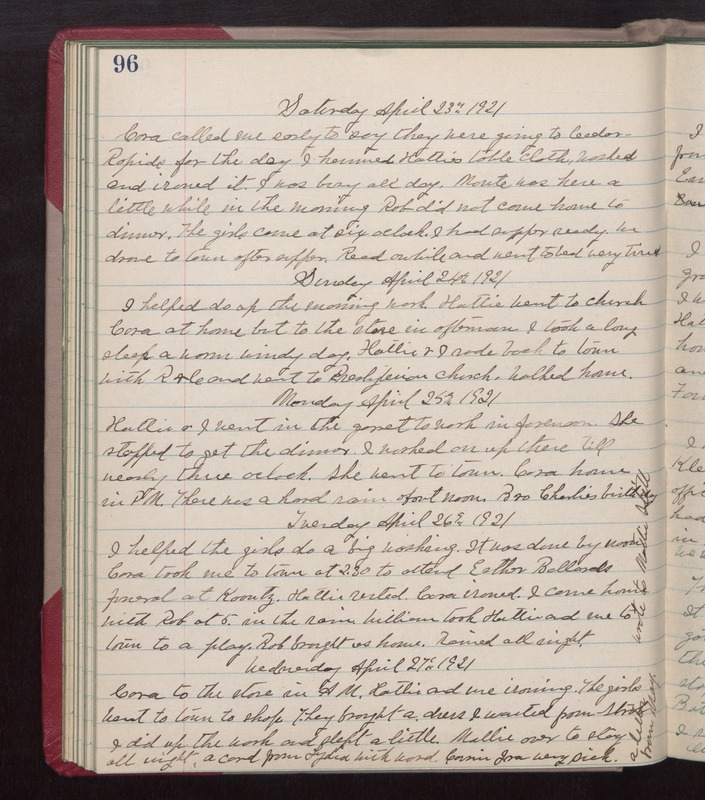 Tuesday April 26th 1921 I helped the girls do a big washing. It was done by noon. Cora took me to town at 2.30 to attend Esther Ballards funeral at Koontz. Hattie rested. Cora ironed. I came home with Rob at 5 in the rain. William took Hattie and me to town to a play. Rob brought us home. Rained all night. wrote to Mattie Stitt. Wednesday April 27th 1921 Cora to the store in AM. Hattie and me ironing. The girls went to town to shop. They brought a dress I wanted from Stroh. I did up the work and slept a little. Mollie over to stay all night. A card from Lydia with Word Cousin Ira very sick. A letter from May.